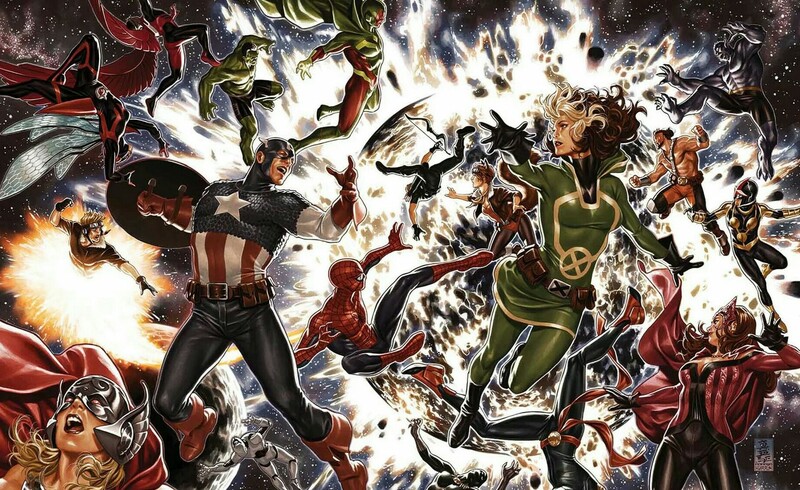 Avengers: No Surrender Review – AiPT! If you’re an established fan this is a great addition to your shelf but I could also see it being a fantastic introduction for a young fan to be. To be honest, I haven’t quite kept up with my Marvel comics, especially Avengers over the years. This probably plays a big part in my enjoyment of Avengers: No Surrender, whether positive or negative, so I wanted to get that out there. Some might call this book a major step in the right direction for storytelling while others might say it’s more of the same old, same old. For me, I lean heavily in the direction of the former. We covered single issue releases pretty heavily here at AiPT! which got generally positive results, but this might be a story that works much better in one cohesive compilation. When it dawned on me that this book would be telling an adventure mostly absent of the biggest Marvel names I was uncertain of its ability to pull me in fully, but it successfully did just that. No Surrender is a prime example of how a perfectly constructed story eclipses the need for mainstream character recognition. The cover art for the trade paperback releasing on December 31st is a little misleading when it comes to the characters you’ll be expecting to make an appearance. The likes of Spider-Man and Black Panther are hardly present while Captain America, Captain Marvel and Vision have little more than a handful of panels. Considering these are some of the biggest names in the Marvel Cinematic Universe, it’s no surprise they would throw them on the cover, but honestly, I found it refreshing that the B, C and even D teams were forced to step up to the plate. It was surprising to see the likes of Rogue, Red Hulk, Cannonball, Falcon and many more used with such prominance, but the way the story unfolds it makes complete sense. Fortunately, why the key players are taken out of action doesn’t feel forced and really adds to the overall events taking place. Some of them even get to see a little action. This approach intrigued me in what an Avengers team would look like if Marvel decided to move on from the core team we’re accustomed to seeing on the big screen. This story might even give precedence for an Avengers film consisting of an entirely new team. The one head scratcher, and why I included my lack of current state of Marvel understanding was the frequent inclusion of Squirrel Girl. I’ll probably get some hate for being out of the loop on this one, but I was not a fan. For those also in the dark, she’s a girl with the powers of…a squirrel. She’s apparently beloved but every time she popped up it took me out of the story. I get her appeal is because she’s so ridiculous, but I prefer “campy” stays out of “end of the world” scenarios. Or at least isn’t put on the same level as some of Earths mightiest Avengers. All I can say is, I don’t get it. Outside of that critique I don’t have many negative things to say about this book and I didn’t let that nitpick interrupt my enjoyment. I can only imagine how difficult it is to try and create a doomsday scenario in a world where every day the planet is in danger of blowing up, but writers Al Ewing, Mark Waid and Jim Zub manage to come up with an original plot that ranks up there with the best of them. It’s fun to see the team as in the dark as we are while putting the pieces together as things unfold. One of the better decisions was to bring back Grandmaster while establishing a new threat on the same level. In addition, a lot of former and new faces make it into this story for one chaotic series of battles. While the hardcover for this compilation was released earlier in the year, if you missed it now is the time to pick up the paperback and get your hands on this story. There are a lot of twists and turns to keep you turning the pages with a real sense of imminent danger. If you’re not a diehard Marvel fan you’ll probably run into a few characters that are unfamiliar to you, but it wont matter much as the writing does a good enough job establishing anyone playing a role. If you’re an established fan this is a great addition to your shelf but I could also see it being a fantastic introduction for a young fan to be. No Surrender is a prime example of how a perfectly constructed story eclipses the need for mainstream character recognition.